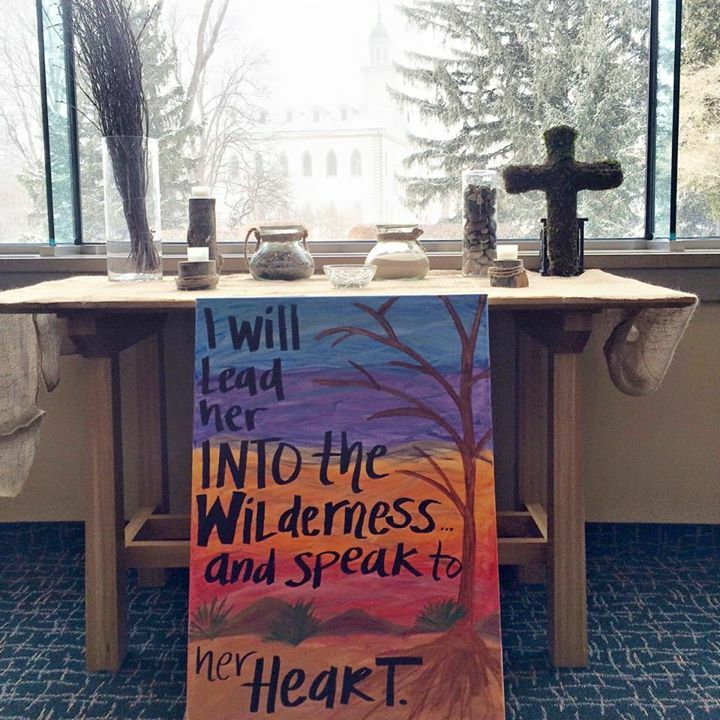 Preparing for our Ash Wednesday service in Kirtland, I create a simple worship center using elements that evoke desert imagery. Rocks clank into a tall vase while sticks, moss, and sand fill other vessels. Last, I place a small glass bowl of ashes on the table. In one of the creation stories (Genesis 2), God breathes life into the dirt to give it form. What does it mean to consider our identity as holy dirt creatures moving around this earth, created mysteriously in the image of the Creator? There is a weighted awareness in Ash Wednesday. The poetic and haunting phrase sings through my heart- ashes to ashes, dust to dust. It reveals what we so often resist. We are mortal, fragile creatures. We are made of matter and will one day be unmade. We are part of creation unfolding… one small part in an intricately connected universe. What we are made of we also depend on, literally, for each blessed breath. Incarnation takes seriously these physical realities and dares to name them sacred. Lately, I’ve felt an ancient longing for awakened human senses. The asceticism of Lent is less about punishment than awakening! It is a desire to really feel and to trust that God is in whatever is most real whether pain or fear or delight or wonder. I spend so much of my life in sterile conditions- work to car to home, cell phone screen to computer screen to television screen. The relational strain I feel this Lenten season is with my own humanness as a member of the community of creation. I can blame it on unceasing snow, but the truer reasons are busyness and numbness. Sometimes I feel too heart-tired to feel, which may be when I need to feel the most. The quickest path to humility can be out the front door into a world I did not make and cannot control in all its mystery, complexity, and stunning intricacy. “You ARE this,” the God-voice beckons within. Lent is this elemental vulnerability that practices seeing God in every condition; even death, even life. We hold out our hands and pray, “Breathe life in this dirt, O God. Become alive in the substance of me.” We mark ourselves with ashes to remember who we are. We await the breath of life that continues to create us. Thank you for your Lenten reflection. This is an important season in my life each year and your imagery, conviction, and honesty is refreshing to read.